The Jogye Order of Korean Buddhism (JOKB) Korea's largest denomination of Korean Buddhism developed in the late Goryeo period, as a means of uniting all of the various factions of Buddhism existing in Korea at that time. Part of the Seon (Zen) School of Buddhism, Jogye Buddhism stresses a search for inner peace through meditation. Buddhism in Korea went through a period of supression during the Joseon Dynasty, when Confucianism gained prominence, and influence by Japanese Buddhist practices during the period of Japan's annexation of Korea. monks following Jogye practice. The order currently comprises nearly 3,000 temples in Korea, organized into 25 districts. Beginning in the seventh century, two major schools of Buddhism developed in Korea, "gyo" or academic Buddhism and "seon" or meditative Buddhism. Adherants of the Jogye order practice Seon Buddhism, seeking a path to enlightment or understanding by connecting directly to the mind of Buddha (the awakened one) through the Dharma Gate (teaching) of wordless communication. Seon Buddism first began in India, and was brought to China in the mid 400s, by Bodhiharmna, the twenty–eighth Patriarch of India, who then became the first Patriarch of China. The Korean Jogye order grew from the tradition of China's sixth Patriarch Huineng (638-713 C.E.). Monks who trained under Patriarch Huineng in China brought his traditions to Korea at the end of the Silla and beginning of the Goryeo period, forming the Nine Mountain Seon Schools (Kusan Seonmun) later known as Jogyejong. The name of the Korean Seon movement is derived from "Caoqi" the name of the mountain where Master Huineng meditated, pronounced "Jogye" in Korea. During the Goryeo period, the Seon order diminished in size. Later, near the beginning of the twelfth century, during the Goryeo period of military dominance, Seon began to expand again, under the leadership of Seon Master Bojo Jinul (1158-1210 C.E. ), who introduced Ganhwaseon meditation as initiated by Dahui (1089-1163 C.E.). Teaching about Ganhwaseon was further developed by National Teacher Jin-gak Hyesim (1178-1234 C.E.) Ganhwaseon and the Jogye order flourished and expanded during the next centuries, with key teachers adding further insights gained during study in China. The order went through another period of decline during the Joseon Dynasty and began to revive during Joseon's declining years under the leadership of Masters Gyeongheo Seong-u (1846-1912 C.E.) and Yongseong Chinjong (1864-1940 C.E. ), expanding further following the conclusion of Japanese annexation of Korea. Japanese Buddhism permits monks to marry, and while the Japanese controlled the nation and the temples, leadership of many temples went to married monks. Great controversy surrounded this issue after the Japanese departed, and over the course of time, the married monks were replaced by celebate monks, in accordance with Korea's Jogye practices. Jogye Buddhism remains strong today, with a significant number of foreign trainees training in the monasteries. The order has 3,000 temples, organized in 25 administrative districts, and five training monasteries located in various locations around Korea. Three Jewel temples represent the three jewels of Buddhism - Buddha is represented by Tongdosa Temple, a special "Palace of the Jewel of Nirvana" temple, where Buddha is represented by enshrined relics rather than a statue is located in Yangsan outside of Busan, while Haeinsa Temple, where the Tripitaka Koreana woodblocks are housed represents Dharma, or teaching, and Songgwangsa Temple, an important training center in the order since the twelfth century represents Sangha, the community of monks. Ganhwaseon meditation is the main component in Jogye practice. Adherants seek to separate from the forces that cause stress, difficulty, hurt and disappoint in their lives and find their True Nature, find their innate value and center their lives on that. With this kind of center comes confidence, constancy and self-sufficiency. The search for one's True Nature begins with a hwadu, a key question that guides the search. The hwadu helps one go beyond rational thinking and the illusions of everyday life and return to the realm of Buddha, enlightment and understanding. Once this understanding is found, the hwadu helps keep emotions and difficulties from taking control of everyday life. Basic teachings include adhering to the Five Precepts (refraining from taking life, from stealing, sexual misconduct, using bad language, and alcohol or drugs). Refuge is Buddhism offers refuge in the three jewels of Buddhism: The Buddha, or enlightment, the Dharma, or teaching and the Sangha, or community of monks. A typical temple schedule includes chanting three times a day, vegetarian meals, and walking meditation. Monks rise at 3:00 a.m. for chanting and meditation until the morning meal at 6:00 a.m., then continue meditation, chanting, study of Sutras (sacred writings) and other activities, retiring for the evening at 9:00 p.m.
ordination at least five months prior to the ordination ceremony which takes place twice a year, generally in fall and late winter. After four years of training at a temple as a Sami/Shramanera (novice monk) or Samini/Shramanerika (novice nun), one can take the exam to become a fully ordained monk or nun (Bikkhu/Bikkhuni). After 10 years in the order, one can take the exam which allows successful candidates to head a temple of their own. Monastics in the Jogye Order are celibate and follow the Dharmagupta Vinaya. There are generally three paths available to Jogye Order monastics. One is the Seon (Zen) meditation path in which one travels from one monastery/nunnery to another engaging in retreat twice per year lasting about 100 days each. Another path is to attend a traditional seminary, similar to a Tibetan shedra. A third option is now available in the modern era in which one can attend a modern university, such as Dongguk University in Seoul. Monastics can also pursue various cultural and artistic fields, such as traditional arts (calligraphy, tea ceremony, etc.). programs to prepare them for leadership positions among the laity. Regular Dharma meetings are now often held on Sundays at many temples, to make it easier for people with regular working schedules to attend. The traditional schedule for Dharma meetings was scheduled according to the lunar calendar, and included the days of the new and full moons, a healing Buddha meeting on the eighteenth, and the Bodhisattva of Perfect Compassion on the twenty–fourth of each lunar month, with other special meetings held to commemorate important teachings days of the year. In addition to Dharma meetings, lay members in urban temples join the monks in offering donations, volunteer services, meditation, reciting sutras, chanting, and offering prostrations. Mountain temples offer retreats and training programs for lay members, varying in length from a few hours to several days or longer. In recent years, many of the temples have begun offering "Temple Stay" programs of two to three days for tourists or other people who want to get a glimpse at temple life. These include Dharma talks, sutra readings, and cultural activities, such as tea ceremony, stone rubbings, temple paintings, martial arts, hiking and examining the historical sites and objects in and around the temple. The Kwan Um School of Zen a Western off-shoot of the Jogye Order was founded by Jogye Grand Master Seung Sahn, who traveled to the United States in 1972 and started his first school in Providence, Rhode Island. The School operates more than 100 centers and groups making the practice of Zen available around the world. A Jogye order temple, Munsusa was also founded in Boston in 1992, to give Jogye adherants living in the Boston a place to practice. 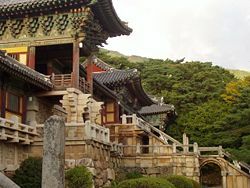 One of Korea’s five ‘Palace of the Jewel of Nirvana’or 'relic' temples, where the relics of the Buddha substitute for a statue. 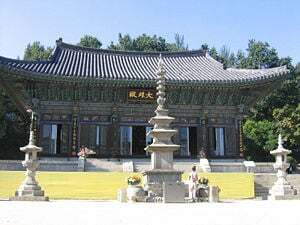 Represents Dharma in Korea's "Three Jewel Temples"
Represents Sangha or community in Korea's "Three Jewel Temples"
Relic Temples 'Palace of the Jewel of Nirvana', where Sakyamuni Buddha is represented by enshrined relics, rather than a statue. Among them, Tongdosa is part of the 'Jewel Temples' and there are four others. Jikjisa: (418 C.E.) 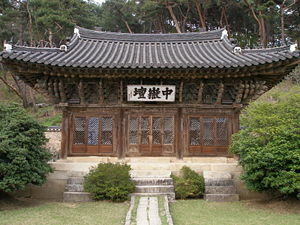 Daehang-myeon, Gimcheon, Gyeongsangbuk-do. Donghwasa: (493 C.E.) Dohak-dong, Dong-gu, Daegu. Eunhaesa: (809 C.E.) Cheongtong-myeon, Yeongcheon, Gyeongsangbuk-do. 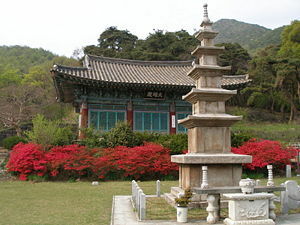 Ssanggyesa: (723 C.E.) Hwagae-myeon, Hadong County, Gyeongsangnam-do. Beomeosa: (678 C.E.) Cheongnyong-dong, Geumjeong-gu, Busan. Gounsa: (681 C.E.) Danchon-myeon, Uiseong County, Gyeongsangbuk-do. Geumsansa: (599 C.E.) Geumsan-myeon, Gimje, Jeollabuk-do. Hwaeomsa: (544 C.E.) Masan-myeon, Gurye County, Jeollanam-do. Songgwangsa: (late Shilla) Songgwang-myeon, Suncheon, Jeollanam-do. Daeheungsa: (426 C.E.) Samsan-myeon, Haenam County, Jeollanam-do. Gwaneumsa: (1905 C.E.) Ara-dong, Jeju-si, Jeju-do. Seonunsa: (577 C.E.) Asan-myeon, Gochang County, Jeollabuk-do. Bongseonsa: (1469 C.E.) Jinjeop-eup, Namyangju, Gyeonggi-do. ↑ Kwan Um School of Zen, The Kwan Um School of Zen. Retrieved February 10, 2008. Jogye Order of Korean Buddhism. This page was last modified on 10 May 2018, at 19:09.